If you love music & babies & want to join our energetic & fun team, please contact Ms. Jennifer! Jennifer Holland is a Licensed Music Together® Center Director & Owner of Music Together Metro Atlanta. Contact her at Jennifer@MusicTogetherMetroAtlanta.com. An Early Childhood Music Specialist and a Registered Music Together Teacher, Ms. Jennifer completed the Music Together Teaching Workshop with Music Together Worldwide in 1998. With her passion for music and singing and her love for babies, Ms. Jennifer has been opening up the world of music for children and their parents for over 20 years! Occasionally, she can be found singing with her guitar for the children at 'Music with Ms. Jennifer' events at local libraries, bookstores & private homes for music birthday parties for 1-4 year olds around the metro area. Ms. Jennifer is also a trained Postpartum Doula and a Certified Labor Doula. She & her husband live in East Cobb with their Music Together babies, who are both now teenagers & musicians. Andrea Owens is a passionate Registered Music Together Teacher that loves bringing music to life in children. Andrea has completed her Teacher Training with Music Together Worldwide and she loves to share music with families in the Hiram and Douglasville locations in West Georgia. She also has a degree from Kennesaw State University in Early Childhood Education, and she taught elementary school for 6 years where she incorporated music daily with her students to enrich learning. Using her love for music, she has also led children in singing and dancing in her community and in Nicaragua short term. Andrea shares her love of music with sweet senior folks with Alzheimer’s and dementia in assisted living communities, and she also volunteers in leading local church groups. Andrea & her husband live in Hiram with their 3 children who have all grown up in Music Together classes! They love to hike trails, sing, and travel together! Allison Krichko loves teaching and devoting her time and energy to young children! As a Registered Music Together Teacher, she is excited to combine her two passions at Music Together Metro Atlanta after completing her training with Music Together Worldwide. Ms. Allison is bilingual & has over 10 years teaching experience and a degree in Spanish Education from Berry College. Growing up in a musical home encouraged her pursuit of singing, playing piano and guitar. Over three years ago she started sharing her love of music with her son by attending Ms. Jennifer’s Music Together classes and loved the program so much she decided to become a teacher! She lives in Smyrna with her husband & two children, who are growing up in Music Together classes. Music plays a big role in the memories they make together as a family. They also enjoy their rescue doggies, any outdoor activities and traveling. Jessi Fai grew up surrounded by her large music-making family. A Singer, Songwriter, and Musician, Jessi started her professional music career at the age of 5, as a member of "ALIGHT," a Christian rock group that toured the Midwest. 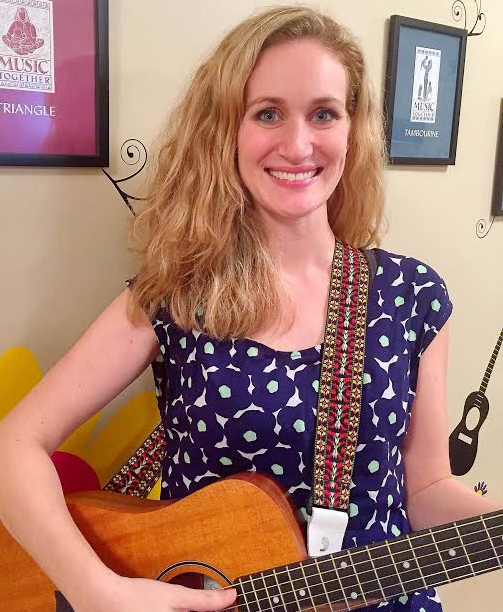 She has been teaching private music lessons in the greater Atlanta area for over 8 years and studied Piano, Voice, and Guitar for over 20 years. Before starting her own family Jessi played at venues featuring local artists at The London Bistro and Ultra Lounge. She has opened for local bands, and won a multitude of singer/songwriter competitions. She enjoys creating a nurturing environment where people feel comfortable making music! Jessi has a passion for making music-learning fun! It is her goal to share her love of music with everyone she encounters, and she is excited to share this as a Registered Music Together Teacher. Jessi currently lives in Smyrna with her husband and preschool Music Together babies. When she isn't making music, she loves playing with her kids, making crafts, enjoying nature, and exercising. Renea Clark is excited to join the Music Together Metro Atlanta team after completing training with Music Together Worldwide this spring! An actress and singer, Renea has been a life-long lover of music and performing arts and wants to share that passion for music with families in the Atlanta area! Renea has over 10 years of experience working with children ages 0-12, and believes using music to connect with them unlocks a a unique perspective of their world. She is a devoted mother to 3 spirited kiddos (plus 2 bouncy rescue dogs), has been a SAHM for the majority of the last 10 years, and is also a Trained Labor and Childbirth Doula. Her favorite things are spending time with her large extended family, being outdoors, traveling, dancing, and anything that can be turned into an adventure! Jordan Forte is registered Music Together Teacher who is passionate and devoted to encouraging everyone, espeically youth, to have a healthy, exciting relationship and culture with music. Ms. Jordan is a classicaly trained vocalist & grew up leading worship and teaching drama camps to youth programs for many years in her hometown church. She loves musical theatre and dance, and performed in community theatre at the age of nine all the way through school. A professional singer, Ms. Jordan tours with corporate party bands across the states performing for a large variety of private events. Currently, she works as the female vocalist in the corporate band A Town A List, clocking in at around 80+ shows a year. In addition to making music, she enjoys taking in a Vinyasa yoga class, telling everyone about her cats, sharing her favorite breakfast & coffee spots around the city with friends, or writing/creating her own original music with other local musicians. Ms. Jordan lives in the Westide of Midtown. Due to busy mom-life & private Music Birthday Party bookings, sometimes our teachers will share a class schedule, alternating weeks throughout the semester. This way, we can continue offering popular class times to serve you better! One class. Two teachers!